As a follow-up to our post yesterday about the wonderful report by Megyn Kelly about the 46-person chain, I want to share with you below some news I just received about the recipient of my donation. This is not a feel-good story, it is the way life happens sometimes; I prefer to think of it as a work-in-process. By way of background, I donated to start a chain in September, 2015. I later learned that my recipient, Danielle, is the mother of three young children with an immune system that made her a very difficult match. I remember that my coordinator at NYPH Weill Cornell was elated to tell me that Danielle had found a match. When I was going through the psychological test portion of the vetting process, I remember the psychiatrist asking me how I would feel if my kidney was rejected by my recipient. I thought about it for a moment and decided, because I was starting a chain and therefore partially responsible for multiple transplants, that I would be sad but I would take consolation in the knowledge that my action resulted in multiple transplants. My donated kidney flew to Colorado and immediately changed Danielle’s life. Her energy returned and her life was great. She participated with me on a Freakonomics podcast in February, 2016, where I spoke with her for the first time. That was a powerful experience. But then, several months later, I learned that Danielle had a very rare disease that was not identified at the time of her transplant. Her (my) kidney was starting to fail. The medical team did everything they could, but the kidney stopped working. Danielle went onto dialysis in 2017, and the joy and hope she had experienced with her new kidney was replaced by the grim reality of life on dialysis. My disappointment and sadness for Danielle has been intense, but at least I had the consolation noted above. But I learned yesterday of another development. The non-functioning kidney in Danielle had become infected and inflamed in some fashion, and she had to have an emergency operation yesterday to remove it. I texted with her today; she is in quite a lot of pain although, as she says, she is as tough as woodpecker lips. As I am processing this information I realize how upsetting this is to me personally, perhaps beyond rational measure. I so want her to get her life back with her family. 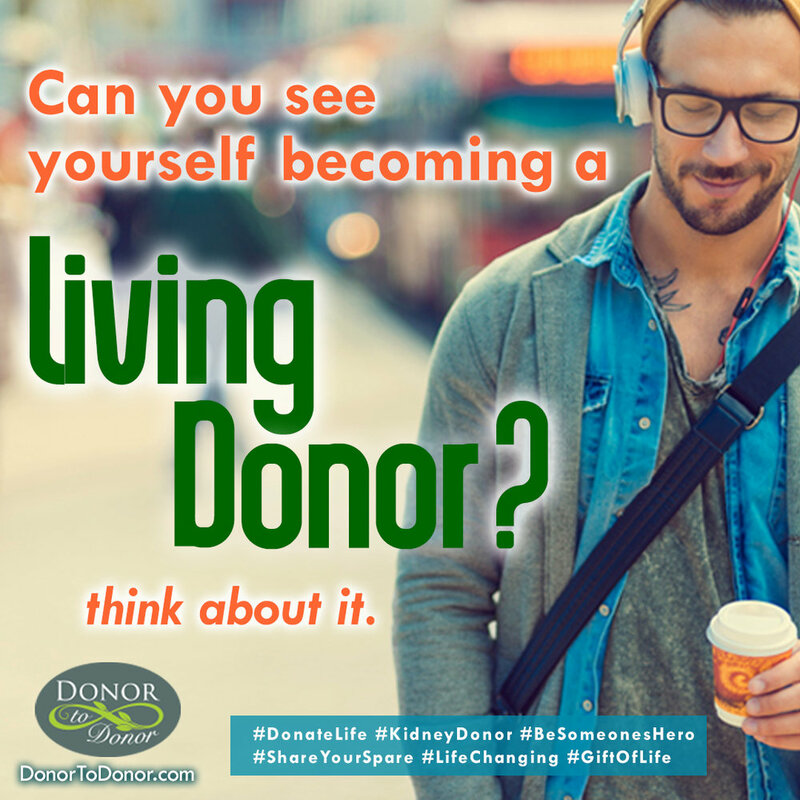 Donor to Donor has been working to find a donor for Danielle, either through a paired exchange or by means of a voucher from a donor who starts a chain. It’s a bit complicated if you are not familiar with the process, but that is why we are here and doing what we are doing. If you would like to know more about different ways to donate, please contact us or look through our website at http://www.donortodonor.com/ . You may see Danielle’s Facebook page here: https://www.facebook.com/Kidney-for-Danielle-1089419757751485/ As I said, this is a work-in-process.